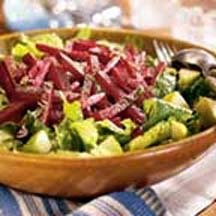 CooksRecipes has quality, kitchen-tested recipes for delicious salads featuring beets as a main ingredient. This salad can't be beet! 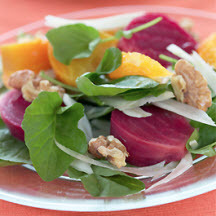 It features roasted beets, a fine way to highlight the flavor of these festive red veggies. The addition of toasted California walnuts adds a finishing touch. Apples make this salad crisp and crunchy, while beets color it richly red. 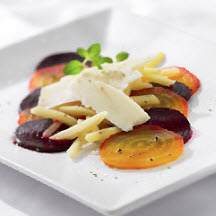 A simple, yet elegant first course salad of homemade pickled quince, sliced beets and thick slices of nutty, slightly sweet Gruyère cheese.